PEMBROKE, Mass. — Observe the alterations expert at work. Watch a pair of pants being altered. The expert lays the pants out, folding on the crease, ironing the garment, turning the garment inside out and measuring the inseam, measuring again, and creating cuffs. The expert, often a seamstress, smooths the cuffs into perfect rectangles. Irons the rectangles. Places each leg under the sewing machine and pushes the pant leg segment through. Reverses the pants and smooths them out. Then irons again. The hands move confidently. The fingertips gain purchase easily. The focus is intense. Pure poetry in motion. So why is the alterations department so often shrouded in the back room? Or hidden by a curtain? Or put off to the side, where you can barely see the work being done? Or in another location altogether? Some dry cleaners may think of the alterations department as an adjunct business, and not the main focus. At any rate, rarely is the alterations department front and center, where it should be. To those dry cleaners who don’t want to show their alterations department because it is only staffed part-time, I say that part-time is better than nothing. Even equipment sitting in an organized workstation is a positive addition. It shows you run a neat, efficient operation. It shows that you do alterations. It leads to inquiries about jobs that could be done. I know one dry cleaner who started with a part-time alterations department in the front which has led to a thriving suit-making trade in an upstairs office. A customer, seeing the seamstress’ skill, asked the dry cleaner if he would have his seamstress fabricate a suit. One job led to another and, before long, business blossomed. If the dry cleaner dislikes the times of non-use, consider it as a form of advertising. Showing a clean, productive space is not wasted space. 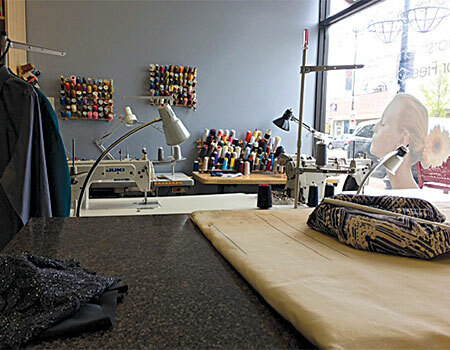 Some owners may shroud their alterations operations because they don’t want customers to gain understanding of the process so they will do the task themselves. Never be afraid to boast of your skill. Such expertise does not come easily to most people. Alterations could lead to specialty niches such as repairing old wedding gowns, which can be lucrative. The work requires minimal capital investment and only a small amount of space. The work can be done 10 hours a week or 60. In other words, any level of work can be accommodated. To put it another way, if you turn away the business, you lose revenue. In that window, where your alterations department is visible, place a colorful, outrageous ensemble, preferably on a half-mannequin, for passersby to admire. The more over-the-top the garment is, the more visibility you’ll get. If you don’t have foot traffic and your alterations department is in the front of the store, have a full-length mannequin dressed in that most outrageous outfit. Drape around the neck a sign that reads, “We made this here.” The customers will know your skill, and that knowledge will stick in their memory when they need alteration work done. In one window I saw a multi-pocketed jacket, with different colors for each pocket, and a ruffled collar coming out of the jacket’s front. All I could think of was Lawrence Welk. Even though nobody under 40 knows who I am talking about, everybody over 60 has an engraved image of the accordionist’s outrageous costumery. Opening an alterations department or making your operations more visible will make you a more successful dry cleaner. Howard Scott is a former business owner, longtime industry writer and drycleaning consultant. He welcomes questions and comments and can be reached by writing Howard Scott, Dancing Hill, Pembroke, MA 02359; by calling 781-293-9027; or via e-mail at dancinghill@gmail.com.